Culantro (Eryngium foetidum) is a culinary and medicinal leafy green/herb commonly used throughout the West Indies ands everal countries in Latin America and Asia. Culantro is native to continental tropical America and the West Indies and has a similar aroma and flavor to cilantro (Coriandrum sativum). It is thought that cilantro, which has its center of origin in the Mediterranean region and was introduced to the Americas by European colonists, was so widely accepted and common in many Latino dishes because of its similar flavor and taste to culantro. In fact, cilantro is more commonly found throughout Latin Amercia that culantro. 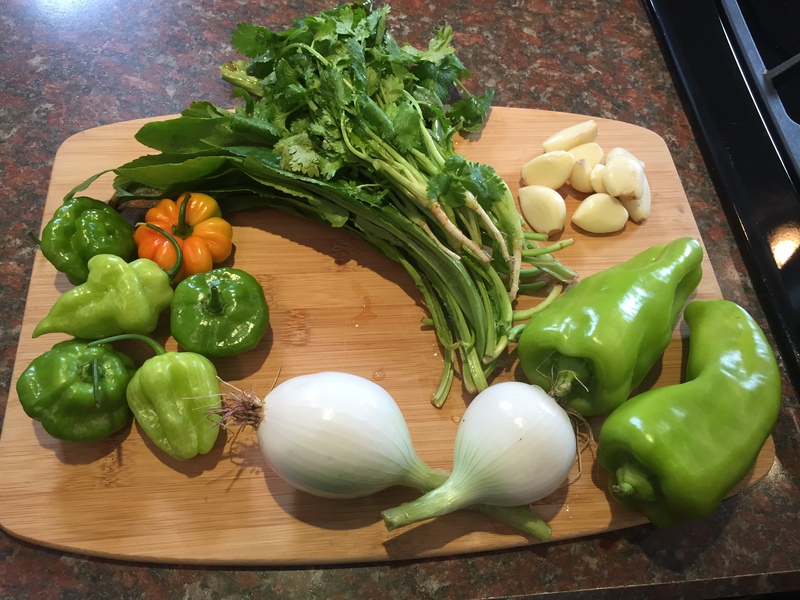 Interestingly is that sofrito (Figure 1), a staple in several Latino countries, has both culantro and cilantro as traditional ingredients. In some countries in Latin America, cilantro (Coriandrum sativum) is called culantro (Eryngium foetidum) and culantro is called cilantro (Figure 2). In some cases, culantro is called cilantro de hoja ancha (wide-leaf cilantro in Spanish), to distinguish it from cilantro (Coriandrum sativum). 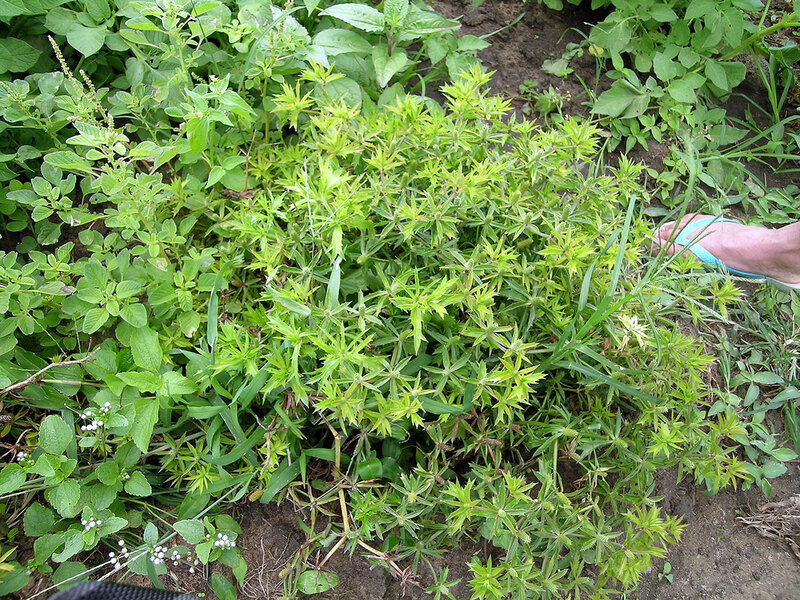 This aromatic herb has many common names, depending on the country where it is used. In Puerto Rico and the Dominican Republic culantro appears to be the most common name, but in addition the recao is used. 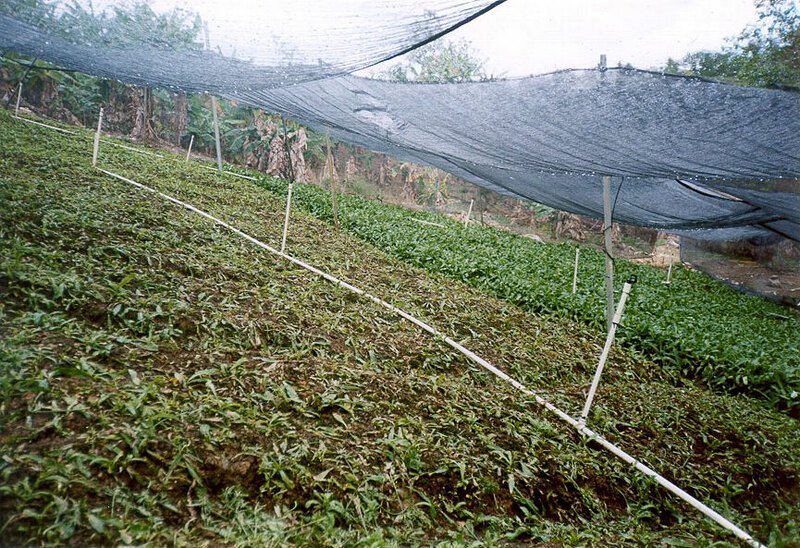 Other names are ngo gai in Vietnam (Figure 3), Culantro de Pata in Honduras (Figure 4), Culantro coyote in Costa (Figure 5), alcanate in El Salvador (Figure 6), coentro do Pará in Brazil (Figure 7), cilantro in Oaxaca Mexico (Figure 8), fitweed in Guyana, herbe à fer in Martinique and Guadeloupe), coulante Haiti, shado beni and bhandhania inTrinrinidad and Tobago. Eryngium foetidum belongs to the family Apiaceae which includes cilantro, carrot (Daucus carota subsp. sativus), parsley (Petroselinum crispum), celery (Apium graveolens), and parsnip (Pastinaca sativa). Eryngium foetidum can be considered a biennial or a short-lived perennial. This crop is mainly used as a seasoning in the preparation of a range of foods including vegetable and meat dishes, sauces, chutneys, soups and preserves. In addition to its culinary usage, E. foetidum is also used for its medicinal properties, among them as an anti-inflammatory and analgesic. Culantro is a tender perennial and is grown as an annual in the Northeastern US. 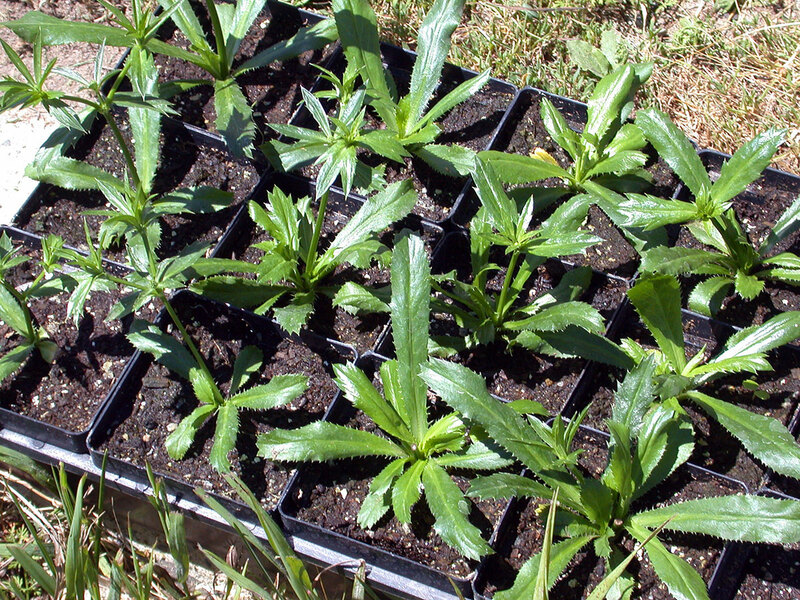 Due to the fact that it is frost sensitive and can take up to three weeks to germinate, even with bottom heat supplied at 75°F, transplants are recommended for the cultivation of Eryngium foetidum in the Northeast (Figure 9). The plants should be set out after the danger of frost has passed. Transplants are spaced 4 - 6 inches within the row and no closer than 6 inches apart between the rows. It is recommended to use the same fertility you would use for leafy greens. 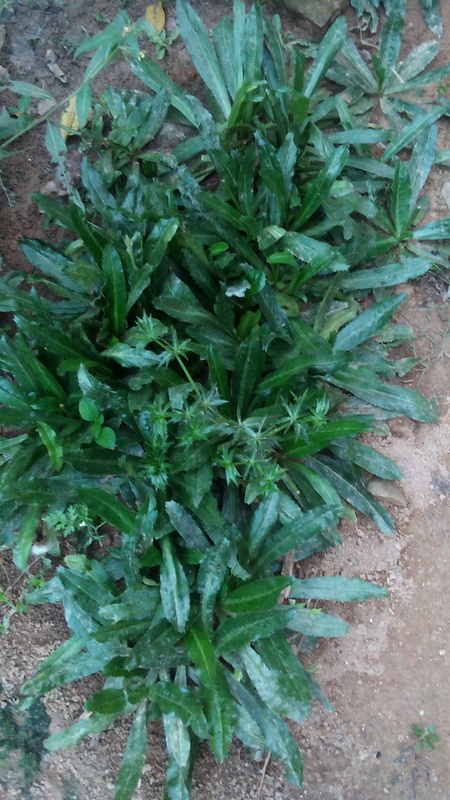 When culantro begins to produce flowers, the leaves become tough and less suitable for eating. The harvest is achieved by cutting the entire rosette at soil level. The flower stalks must be pruned regularly in order to maintain vegetative growth and maximize yields (Figure 10). 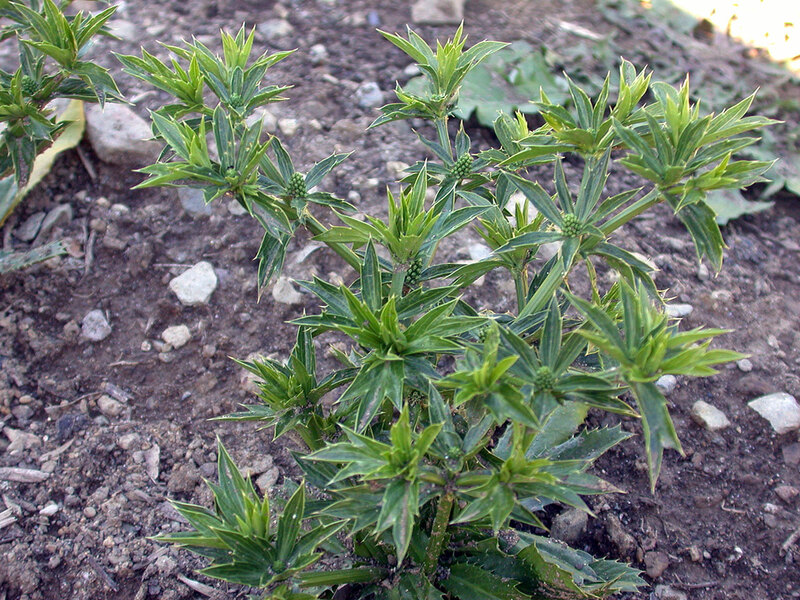 Although cultivation of culantro is possible in full sun, the plants tend to flower sooner than shade-grown plants and have an inferior quality due to decreased leaf size and a loss of succulence. Flowering occurs at the expense of continued vegetative growth. Plants grown under shade produce larger and greener leaves that are more marketable because of their better appearance, texture, and pungent aroma. Owing to the increased production costs of pruning the flower heads frequently, it is in the interest of grower to reduce the level of flowering. Research at the University of Massachusetts indicates that culantro is sensitive to daylength. The onset and rate of flowering is enhanced as the daylength increases. Since the production of flowers is detrimental to the growth of leaves, the long days of summer make this a difficult crop to produce commercially in the Northeast. Seed is available from Richters Herbs, where it is called “Mexican coriander”.